An all-women dinner at Medlar Chelsea was a snapshot of the tastes for the current generation of women in the fine wine trade. I admit, it was not an easy brief. Bravo to Clement Robert for he took it all in his stride. He certainly lives up to his title of UK Sommelier of the Year and more. The sequence of wines to come out to the table was sheer brilliance. Brought out in pairs, each echo and chimed. The night was unusual for me because it was only women. 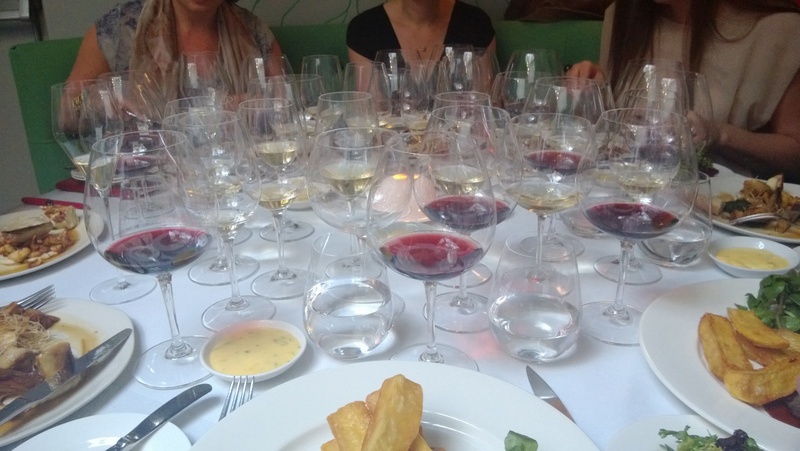 I find at most fine wine dinners, most of my dinner companions are men (and I am certainly not complaining, just noting the unique difference of the situation). It all started with a conversation with my friend Camilla Bowler about the differences we face compared to our male peers and wondered if there were other women in similar jobs and at a similar age who may have thought the same. Let’s bring a group of people together, everyone can bring a wine, and have a good old fashioned chat about it. And that’s probably one of the biggest differences: the chat. Amongst the talk about the benchmarking of prices of 2004 Bordeaux (instead of 2008) against the 2012 vintage, or the moving over of an older generation from the industry or the challenges of the economy on the wine market as a whole, we got to talk about wine quite differently than I do with men (in general). The information about the wine by each person was imparted as subtly as Clement moving around the table, who was almost whispering the name of the wine individually to each person before he poured. In fact, if it wasn’t for Ruth Ford’s notes below, then I would not know some of the facts talked about at the other side of the table – the information was weaved into the conversation. No one had the loudest voice (maybe some had a louder laugh… ahem). The other thing I noticed was the selection of wines. I do not see any Robert Parker 100 point wines (surprisingly, as many of us sell Fine Wine) or big alcoholic wanky-sized bottle monsters (again, not necessarily only women feel this way but I see it more often appealing to men). I feel as if each wine was brought because of the story behind the wine – whether personal or viticultural. On the whole, the style of the wines were all supremely fine and refreshing – could this be because of the subset group of the wine trade (women in fine wine)? I don’t know. Also a couple of the wines are distributed by Louis Dressner or Kermit Lynch in the US – not surprisingly, as they also share a love of the story behind the wine. Ruth Ford’s notes from the night, who thankfully wrote down each name throughout the dinner (and my notes in bold afterwards). Ulysse Collin Blanc de blancs – based on 2008 reserve wines but not labeled as a vintage because it doesn’t spend enough time on the lees. Fine & Rare get just 18 bottles of this per release! Incredibly fine bead and extremely invigorating before dinner, perfectly balanced, in the Selosse camp of innovative style. Arnaud Ente Bourgogne Chardonnay 2009 – everything you want from the first white wine of the evening, tastes a lot more than a villages level – great curl of fruit overlaying good acidity. Querciabella Bátar 2010 IGT Toscana – barrel fermented Chardonnay and Pinot Blanc. Originally called Batard until they were asked to change it… In fact – I thought it tasted like a Puligny Montrachet at first. A wonderful match with the Arnaud Ente to compare and contrast, it worked wonderfully with the crab ravioli. Raúl Peréz Ultreia La Claudina 2011 Bierzo – Barrel fermented Godello; only two barrels produced per vintage. This is the first time I have had a white Bierzo. Very lively, dancing wine on the palate, it developed a serious minerality with crab ravioli over time that took me by surprise. A revelation. Lopez de Heredia Viña Tondonia Blanco Reserva 1987 – there’s quite a nice story about how I acquired this wine which I’ll bore you with another day. Alongside the Bierzo, this was my favourite pairing of the night – inspired decision, Clement! He kept half of the wine for the cheese later. After having only recently tasted the latest release, this was like one of those snapshots for a miracle face cream. The fruit had melted away to become a pure calm that had ironed out any wrinkle of fruit over time (not that it ever had a lot anyway). It was also worth hearing the reason why it was chose for the theme: Macabeo is said as Biura in Spanish! Domaine Follin-Arbelet Corton-Les Bressands 2001 – I loved this. Just very fine, precise, long and delicious. + 1 Refinement personified. Delicate and assured. I was asked alot about this wine the next day at work. Bouchard Père et Fils Hospices de Beaune Volnay 1er Cru ‘Cuvee Blondeau’ 2003 A good weight and fruit on the palate, necessary to stand up to my underblade steak and snails with bearanaise sauce. Again, another excellent contrast with the Follin-Arbelet beforehand. Spitzerberger Blaufrankisch 2009 – really enjoyed our blind tasting of this and what everyone came up with. Rather meanly, especially for the MW students after their harrowing blind tasting exam, I asked Clement to serve this in a decanter. Georgina Crawley came up with a brilliant observation, “It is like Loire crossed with Rhone.” Spot on. I have never had an older Blaufrankisch, it was slightly hot on the finish for my taste but worked with the steak. Château Phélan Ségur 2007 – This was my back up bottle. It was a bit lean with a touch of green character that I personally do not like – and I am a big fan of Phelan Segur. Suspect it was the bottle (it had been kept in not ideal conditions and I have tasted many bottles of 2007 Phelan Segur that have been better). Schloss Lieser Niederberg Helden Riesling Beerenauslese 2011 (half bottle) – made by Thomas Haag So thrilled to have tasted this wine after recently tasting the 2012 Rieslings (with less botrytis than this year). It is extremely young, but it did not suffer for it, as the freshness was uplifting after a big meal. I would love to try this wine again in another ten years.